"Andrew takes his music very seriously. It is not merely a hobby, but a way of life". are reflected in this painting of his viola. I once told Karen I didn't know the difference between the violin and the viola, so she explained. "The difference between a violin and a viola is about Three Thousand Dollars! A Viola is a violin on steroids." Karen's explanation of the two instruments may sound quip - but it's true. Andy's Viola is a 1956 replicated 1594 "Stradivarius" Viola. With Andy's leaving, his viola is even more precious than before. "It's hanging on the wall. It's priceless." They were only college kids. But they were extremely special to Andy, and will forever be special to his mom. "Andy loved them and so do I." Some interesting factoids about this composition: I picked up the Cincinnati Symphony's rendition and the Furman kids blow them out of the water! KEITH LOCKHART, the conductor of the Cincinnati Symphony (who produced the CD I bought (and NOW CONDUCTOR of the BOSTON POPS) graduated from Furman and Andy saw him on campus doing master classes!! The first movement of Sea Symphony was played at his funeral. The second movement, (which I call the viola movement), Andy had remarked that the soloist at the end of the movement "ROCKED"! The third movement, Andy told me, took the students 3 months to learn. And, if you listen to it, you'll understand why. The 4th movement is something I play at night to help me sleep. The professor could not obtain the music for years, and he had to transcribe the oratario and symphony. The female soloist in the first movement was NOT a music major, but she was breathtaking. I would be happy to send to anyone who would like, a copy of Andy's Last Concert: Sea Symphony, Ralph Vaughan Williams, New World Symphony. Please email me at andys_child@yahoo.com if you would like a copy of either his last classical concert or the only techno-industrial recording that exists. His music, his art and his smile keeps him alive in my heart and soul. Sharing his music with you will help keep him alive forever! To say that Andy had "accomplishments" in the field of music is much like stating that Beethoven had "some luck" with his compositions. I had asked Karen to try to 'list' his 'accomplishments', if she could. They seem endless. "He won a seat in the All State Orchestra twice. Once at 13 years of age and once at 16 years of age. Twice! 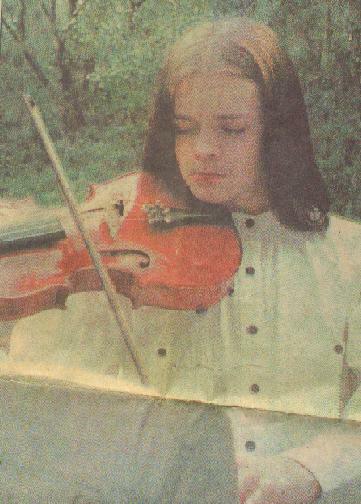 He was also 'self-taught' - no viola teachers in Beaufort back then, and I don't know if there are now either. He also won a seat in the then prestigious Governor's School of Refined Arts. The audition alone cost $1,000 for the 5-week audition." Was it worth it? YOU BET! "Andrew is wonderful and very talented...a real leader." Andy was recognized during his final concert with the Beaufort Chamber Orchestra. You can watch and listen to his final concert by clicking on his picture above. Andy's Last Classical Concert was at Furman University. I call it his $25,000 concert, because that is the entire cost of a year at Furman. We struggled, despite 10 scholarships, to pay for it. He needed a GOOD instrument, and I told him I had no money for a good instrument for him to audition with. He had two Cremonas, one for High School and one for home and the Beaufort Chamber Orchestra. I told him unless a bag of money fell at my front door, he had to audition with what he had. Dad had taken out a life insurance policy on Andy, and when I called them to tell them Dad was dead, and cancel the policy, little did I know the exact cash value was the amount of money needed to buy Andy's Roth replica Stradivarius. A bag of money landed on our doorstep, and Andy SAILED through all of his auditions. Remember, he was a self-taught musician. There were no viola teachers in Beaufort in the '90s. Andy was invited to audition for Juillard, for Ithaca, for Brevard and for Johns Hopkins and so many others. But we couldn't afford to make the trips to audition. I cannot describe the guilt of not being able to provide a gifed child what he deserved. His father had abandoned him at age 3 and had no interest nor concern in any aspect of his life, knowing full well the life and death issues Andy faced at that early age. So he cinched his Furman audition (despite a 17% acceptance rate that year). He clinched it With his ROTH! Andy did without his entire life, and he so deserved the BEST! He gave it all. He never got it all, but he always gave 400%.